We give you the newly named South African Town of the Year by Kwêla! Not only is Mossel Bay the newly named Kwêla Town of the Year for the second time, but we also boast with the second most moderate climate in the world. Our Blue flag swimming beaches are safe and relaxing, we have great activities, sports, art, culture and restaurants. Located in the heart of the beautiful Garden Route and only a shot scenic drive away from towns like Hartenbos, Oudtshoorn, Knysna & Plettenberg Bay. The whole Garden Route is at your doorstep, perfect for day trips! Mossel Bay is loaded with fun and adventurous activities for both the adventure seeker as well as the whole family. In and surround the town you can go on boat excursions seeing dolphins, seals and sharks as well as whales during the whale season ( July – November ). Mossel Bay’s shark cage diving is a adventurous and fun activity that is sure to get your adrenalin rushing! You can also explore the edges of the town underwater with our popular diving & snorkeling spots. Other activities in the area includes elephant excursions at Indalu Game reserve, game drives at Botlierskop, Garden Route Game Lodge and Gondwana. We have quad biking excursions, sand boarding down South Africa’s longest dune, the Dragon as well as horse back riding. You will never be bored when visiting! We have 2 great golf courses in Mossel Bay. The Mossel Bay Golf Course is a 3 minute drive away and the popular and new Pinnacle Point Golf Resort about 10min from our doorstep. The rest of the Garden Route is laden out with championship courses..all a short drive away. You can easily play the likes of Fancourt, Oubaai, George Golf Course, Kingswood Golf Course, Simola, Pezula and Goose Valley. Make Edward Charles Manor you base for exploring the famous Garden Route Golf Courses. Mossel Bay has all the normal franchisee restaurants. 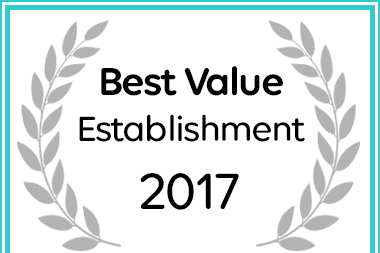 But what really make our restaurants special is their quality and unique locations. You will find Sea Gypsea, Kaai 4, The Oyster Bar and the London Bus at the harbor. The Gannet, is a very popular restaurant located near the museum and tourism information centre. At The Point you will find Kingfisher, Delfinos, Big Blue and Pontos, all located on the rocks with great ocean views! When driving in to town you will a find few more, the biggest stand outs would be Cafe Havanna with their tapas meals and bar as well as Route 57, World top 20 golfer Louis Oosthuizen’s restaurant. This is a semi formal restaurant with great options and delicious wines. The Garden Route is growing so fast as more and more wine farms are emerging with their own micro-climates. The most popular is ofcourse Jakkalsvlei Wines. A short drive toward Herbertsdale where you might spot some of the Big 5 on your way. Jakkalsvlei Wines has grown in leaps and bounds. It is friendly for the whole family with their play areas for the kids. They also have a modern location and serve some of the best pizza I have tasted. Other than Jakkalsvlei, we also have the popular and award winning Boplaas in Calitzdorp, a few farms in Oudtshoorn and also a few around Plettenberg Bay. Just ask your host for more information on the surrounding wine farms as well as any of the activities and restaurants in our town.